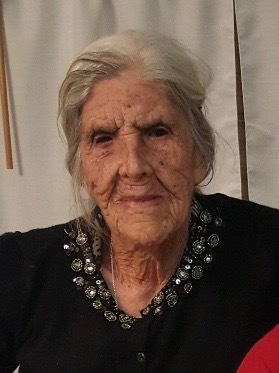 Angelina Chacon Apodaca, 93, was born on November 20, 1924 in Guadalupe, Guerrero, Chihuahua, Mexico to parents Adela Apodaca and Uriel Chacon and went home to be with the Lord on Saturday, March 31, 2018. Angelina was the fifth of seven children, and grew up and lived in Guerrero, Chihuahua until the age of 20 when she moved to El Ejido Tres Ojitos, in Madera, Chihuahua following her marriage to Romulo Dominguez Ledezma. Angelina was a devout catholic and attended church at St. Joan of Arc Catholic Church in Elkhart, Kansas. She will be remembered for her strength, energy, playfulness, ornery, and sensitivity. Angelina is preceded in death by her parents, Adela Apodaca and Uriel Chacon; husband, Romulo Dominguez Ledezma; son, Ruben Dominguez; sisters, Lupe, Concha, and Clara; and her brothers, Fidel, Amado, and Uriel. She is survived by her daughters, Alicia Dominguez, Manuela Dominguez (Ramon Camunez), and Dora Dominguez (Ever Avitia); sons, Arturo Dominguez, Luis Dominguez (Rosario), and Jesus Dominguez (Kathy); grandchildren, Angelica Camunez, Valentin Camunez, Jose Ramon Camunez, Isabel Camunez, Maribel Dominguez, Rosalba Gil, Jorge Bencomo, Mayra Gil, Leo Gil, Martin Gil, Susana Bencomo, Aida Gil, Daniela Avitia, Eduardo Avitia, Luis Dominguez Jr., Stephanie Dominguez, Arturo Dominguez Jr, Cynthia Warren, Graciela Dominguez, Marisa Dominguez, Hermila Dominguez, Dalia Dominguez, Nora Dominguez, Nidia Dominguez, and Nereida Dominguez; great-granchildren, nieces, nephews, and a host of family and friends. Serving as pallbearers are: Luis Dominguez, Arturo Dominguez, Ever Avitia, Jorge Bencomo, Jose Ramon Camunez, Arturo Dominguez Jr., Luis Dominguez Jr., y Eduardo Avitia. Funeral Mass will be Wednesday, April 4, 2018, 2:00 P.M. At St. Joan of Arc Catholic Church in Elkhart, KS with Reverend Frances Khoi Nguyen officiating. Burial will follow at the Elkhart Cemetery, Elkhart, KS. Visitation will be Tuesday, April 3, 2018 from 10:00 A.M. until 8:00 P.M. at Garnand Funeral Home, Elkhart, KS.